Here's a Swedish classic dish for you! It's called Kåldolmar - "kål" means cabbage, and you'll recognize the other part of the word, "dolmar", as related to "dolmades", the greek dish. This is essentially a meat filling wrapped up in cabbage leaves, then fried or baked. It's also traditionally drizzled with a bit of golden syrup, to give that sweet-salty taste that is very common in Swedish food. It's usually served with boiled potatoes, a simple gravy and lingonberries. Allow quite a bit of time to prepare this - boiling the cabbage and loosening the leaves does take longer than you'd think. Other than that, it's a breeze - especially since I make this in the oven rather than in a frying pan. Cut around the stem of the cabbage, and boil the entire head in salted water. Loosen the leaves as they soften - one at a time, and be careful. Put on a plate to cool off, and cut off the toughest stem part, so that the leaves are easier to roll up. Fill the leaves with about 1 tbsp of filling, and roll up tightly to form a neat package. Place in an oven-proof dish, seam down. Scatter over a few pats of butter, drizzle with golden syrup, and bake for about 40 minuter. When it's ready, remove dish from oven. Pour off any liquids into a small saucepan, add water, and bring to boil. Add a bit of liquid stock (or a cube) and soy sauce, and use cornstarch to thicken if it's too liquid. Serve with boiled potatoes and lingonberries. Tyckte jag läste att du skulle kalla dem Cabbage roll-ups, men du kanske tyckte Cathy´s förslag var bättre? I also use half beef half pork for stuffed cabbage, I think it gives it more flavor. The history of this dish: After losing the Battle of Poltava in 1709 Charles XII of Sweden fled to the city of Bender, in Moldavia, then controlled by the Ottoman Empire. There he spent two years in exile, trying to convince the Ottoman Empire to help him defeat the Russians. Charles returned to Sweden and he was followed by some of his Ottoman creditors whom he had borrowed money from to finance his wars. The Ottoman creditors lived in Stockholm between 1716 and 1732, and during this time it is most likely that the dolma was introduced in Sweden. You'll have to excuse me, I'm from the United States. I was looking for a recipe for Kåldolmar and I came to like yours, but I have no knowledge of Swedish lingo. What are lingonberries and what is golden syrup? :) Maybe some time I may figure out more about Swedish food and language. Thank you for sharing this recipe! 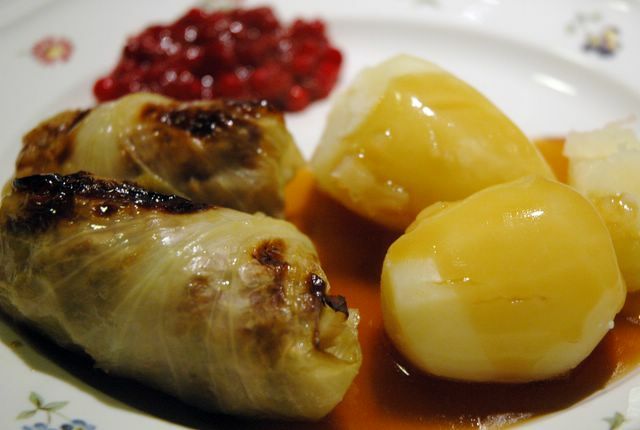 Now this is really very interesting since one of our national dishes, stuffed cabbage or töltött káposzta in Hungarian is a cousin to your kåldolmar with its quite obvious Turkish descent (Hungary being occupied by the Turks for 150 years). The dish itself is quite different as for its taste, it follows the paprika trail that must have somehow get lost on the long way to Scandinavia. Here's a very short and simplified recipe just to give you an idea: http://www.fsz.bme.hu/hungary/cuisine/foods/stuffed_cabbage.html. I have been meaning to make this for a really long time, thanks for providing such a down-to-earth recipe! They look wonderful! Kaldolmar was one of my favorites growing up, up until my mom got lazy/busy and transformed them into kalpudding. Which is tasty too but without the pizazz of the dolmas! Sirap/golden syrup is available along with the lingonberries at IKEA, actually. At least where I shop, in East Palo Alto, CA. Lotta K - oooh, I didn't know that Ikea had that, too. Good to know! A lot of people usually ask, and at least I can try sending them there. And the recipe really was easy - the only fiddly part is getting the cabbage leaves separated, and there's really no way to get around that that I can think of. Stuffed cabbage has always been a favorite but I am intrigued by this version. Ours is usually in a tomato based sauce. I love the idea of the sweet and salty. I am definitely going to try this. According to Merriam-Webster dictionary the word "dolma" comes from Turkish which means literally something stuffed. Swedish "sirap" is "treacle" in English. Carl H - I thought treacle was closer to our dark syrup, and not very much like the lighter version. Treacle comes in both versions. Dark and golden, because it is the same as the Swedish sirap. Golden sirup is just a form of golden treacle (ljus sirap). Using my grandmother's recipe, who was from Galicia, I prepare the cabbage rolls with beef and rice. Place them in large oven proof pot, pour enough water in to go halfway up. Cover with 2 cans tomato puree, or 1 puree, 1 crushed. The seasoning is fresh lemon juice, honey, and a can of jellied cranberry sauce. It comes out sweet and sour. Fabulous. Cabbage rolls. Sounds new to me. I never heard that kind of food before. I wonder how it tastes. It looks delicious. I think I am going to give it a try. Dolma means 'stuffed' in Turkish, the word and the food passed from Ottomans to Greeks, so dolmar comes from Turkish, not the greek word dolmades. If you read the history of how the food passed from Ottomans to the Sweds you'll see it better. I just made this tonight and it was really wonderful! Thank you for the fabulous easy low carb recipes!